George Desarmes is coming to Vassar! We are proud to host George Desarmes (a.k.a. Yves Michaud) for a Meet the Artist session at the Annual Art Auction & Sale next week. In addition to showcasing and debuting Desarmes’ numerous paintings, the event is an exciting opportunity to meet a gifted Haitian artist, and gain intimate insights into his life and creative vision. 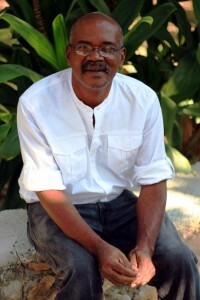 Desarmes was born in 1950 in Port-au-Prince. Throughout his impressive career beginning in 1969, he has made his mark as an accomplished artist, and has painted and exhibited around the world. He draws inspiration from the streets, landscapes and vibrancy of life around him. Using thick and rich colors, Desarmes paints with broad impressionist brushstrokes to capture the beauty of Haitian life as well as the grandiosity of Haiti’s sea and landscapes. In addition, read about the students’ meeting with him on the trip last week!